e.l.f. 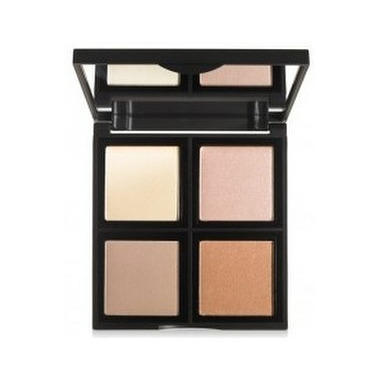 Studio Illuminating Palette holds 4 gorgeous complementary shades to mix and match for a custom blended radiance that captures, diffuses, and softens the way light reflects on the skin. The soft-focus powders are great for highlighting around the eyes and on cheekbones to enhance the skin with a luminous effect. Perfect for all skin tones. Very little effect for shading or highlighting. So many uses for this. Like it a lot! I don't know if it's my skin tone, but I found this palette to have almost zero payout. I tried lightly sweeping it on my skin and then a heavier application, and all it did was deposit a fine glitter, which wasn't a look I was going for. On the positive side, the four colours come in nice sized pans and the big mirror on the inside is great. This is a nice palette. The highlight is very subtle. and the colours very pretty. Great versatile palette for custom application. The shades are very subtle and can be worn alone or great for setting more intense liquid/cream highlighters. The palette is bigger than I expected. This is the best highlighter palette I have ever tried. Great quality, easy to apply and the price is amazing! I love this stuff!! Gives me a gorgeous highlight that looks like a sheen and wet highlight! Very natural! A beautiful glow, not a powdery dry glittery one! I use this everyday! This is a natural highlight pallet which I was looking for, for everyday use, these are not super shimmery and will not give you a super glowy look. The powders are soft and feel like something you would buy in a department store. Very nice pallet, I use it everyday. LOVE IT ! love the mat highlight! as i am over 50 ! add just a twinkle to my cheeks ! I like the colour choices but twice one of the powders has broken into sand just from jostling in my purse.